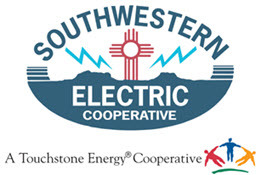 We welcome you as a member or consumer of Southwestern Electric Cooperative, Inc..
As a cooperative, we are member-owned and our commitment to you is to provide the best possible electric service at the lowest possible price. We're glad we can be of service to you. We're open to the public Monday through Thursday from 7:00 a.m. until 5:30 p.m.
Any questions or requests, including inquiries about your bill, can be handled during those hours by simply visiting our office or calling 575-374-2451. Emergency services are available after office hours and on weekends by calling our office at 575-374-2451. We sell electricity, but our real product is service, and we are determined to deliver a quality product.